The third car Lexus ever built was a midsize two-door coupe called the SC 400. But really, it was the second; the ES 250 was little more than a Camry with a gold badge. Released in 1991 as a 1992 model, the V-8-powered beauty was deemed a hit. Motor Trend handed the SC 400 its Import Car of the Year honors in 1992. A year later, the 2JZ I-6 version made its debut, known as the SC 300, and it could be had with a manual transmission. A decade later, Lexus replaced its original coupe with the SC 430, a vehicle few under the age of 65 ever coveted. After selling 720 units in 2009, the SC 430 quietly went out of production, and no one noticed. That seemed to be it for big four-seat Lexus coupes—the current RC is a step down, size wise. 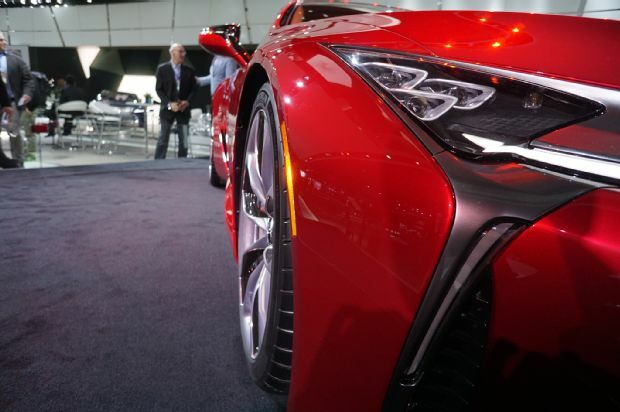 Sure, they showed the radical LC-LF concept car at the 2012 Detroit auto show. But I remember standing on the stage, looking at the concept, and thinking, “Lexus is never going to build this.” Imagine my surprise then when we published a story last year detailing the fast-tracked four-year development process behind the all-new LC 500. Actually, I wasn’t surprised at all, because we worked on that article for years, and our own Randy Pobst helped Lexus engineers to develop the thing. I was rather excited when I climbed into an early build of the production LC 500h outside the Gran Melia Coln Hotel in Seville, Spain. Incredibly, Lexus took the far-out looks of the LC-LF show car and turned them into a real deal production vehicle. To be fair to the design team, which is based in Newport Beach, California, the production version is even better looking than the LC-LF. I still find Lexus’ design language upsetting; in my eyes, the new look is both extreme and weird looking for the sake of being different. It’s just too much. The steering feel was excellent on both cars, and they seemed eager to change direction, especially just off center. On the road, well below either car’s limit, there was no hint of understeer. The front end felt incredible stiff, planted, and well-tuned. Once on the racetrack both cars showed a tendency toward understeer, with the V-8 being the worse offender. Counter-intuitively, the LC 500h also felt the more balanced of the two, especially on the track. Credit better weight distribution, mostly because of the heavy, trunk-space-eating battery that sits behind the rear seats. However, it wasn’t a very good track—a development course in Spain called Monteblanco Circuit—because about half the corners were the throwaway variety—corners so tight you can’t take the ideal racing line, so you just toss it and set up for the straight. The V-8 was much quicker, sounded better, and shifted better. Plus, it was ultimately more fun to drive, specifically when equipped with rear-wheel steering, something I’m tempted to call a must-have option. On the road, the LC 500 was most definitely the better driver’s car, if only for the sound. I have two big gripes. To summarize, Lexus has built a better BMW 6 Series. Their target demographic is men over the age of 50 who earn around $250,000 per year. Big coupes that shout, “I’m a banker! I’m a banker!” obviously don’t occupy a large market segment, but Lexus feels the LC has the mojo to move about 5,000 units per year. The good news is that the car is good enough to hit, if not double, that sales target. Lexus hasn’t announced pricing yet, but they did say that the competitive set is around $80,000 to $120,000. You can bet that the LC will be on the lower end of that. If I had to guess, I’d say the LC 500h will be closer to $80,000 than not, and the LC 500 will be close to six figures but nowhere near $120,000 even with plenty of options. That space will be filled by the not-so-secret, most-likely-twin-turbo V-8 LC F that we should start seeing next year.